Can't get enough chocolate kisses? 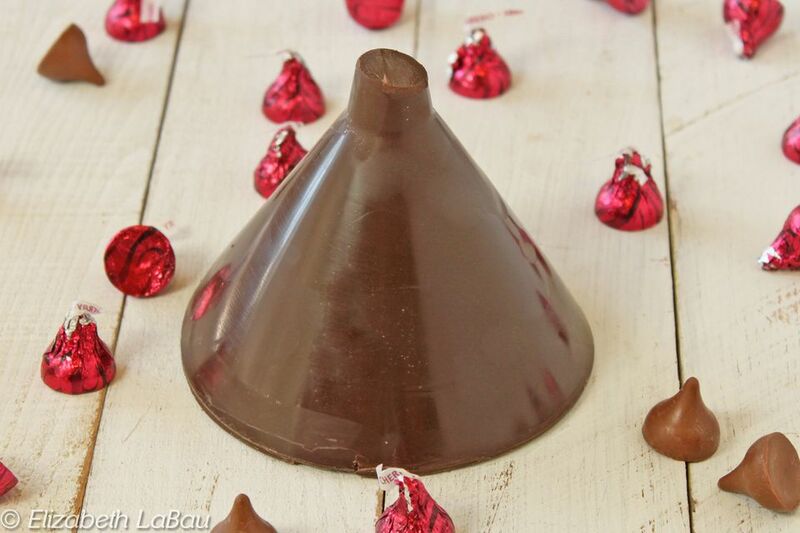 Time to take your Valentine's Candy game up a notch by making this HUGE Chocolate Kiss! This crazy candy is a full pound of delicious chocolate, molded in to the shape of a kiss. It's easy and fast to make, and will delight any Hershey's kiss lover. You'll find it's perfect for Valentine’s Day, anniversaries, or any occasion when a small “kiss” just won’t do. Make sure you purchase good-quality chocolate for this one: since the kiss is solid chocolate, it pays to buy the best. You will need a large funnel, about 6 inches wide and 6 inches long for this recipe. 1. Fill a large measuring cup or wide-mouthed vase with rice. 2. Wrap a piece of foil around the bottom of the funnel’s opening and keep it in place with a rubber band or with tape. Securely place the funnel in the measuring cup. The rice will keep it from moving around. 3. For the best results, temper the chocolate following these instructions. If you do not want to go through the tempering process, you will need to keep the chocolate kiss refrigerated, otherwise it might become soft and sticky at room temperature, or develop unsightly white or gray streaks known as "bloom." 4. Pour the chcoolate slowly into the funnel until it almost reaches the top. Allow the chocolate to cool to room temperature, then refrigerate it until it is completely set (at least 5 hours, or overnight). 5. Once set, remove the chocolate kiss from the refrigerator and take off the foil on top. Flex the funnel slightly to loosen the chocolate, then unmold it by rapping the bottom of the funnel on the counter top. The chocolate should pop right out. 6. Assuming the chocolate is tempered, let it come completely to room temperature. Wrap the kiss in a square of foil, twisting at the top. Include a note on a paper “flag” if desired. Note:You can use any size funnel you have on hand, but bear in mind that the quantity of chocolate you need will change. Any extra tempered chocolate from this project can be saved and used for a later project.